Glucosamine Chondroitin 750 Comlpex is a high potency superior broad spectrum joint support formula, that supports healthy joint cartilage. Unhealthy and inflamed cartilage is responsible for painfull, swollen and stiff joints. The high potency formula is further boosted with MSM and Bromelain which are both natural anti inflammatory joint treatment agents. Glucosamine is a building block of healthy joints that support and nourish connective tissues and cartilage. It also reliefs joint stiffness and prevents degeneration of effected knee joints. Chondroitin sulfate is a promising treatment for Osteoarthritis, it is an effective treatment for Osteoarthritis of the finger, knee, hip joints, and lower back. It is a slow-acting medication that may lead to reduced doses of other arthritis drugs. Chondroitin is a major component of cartilage that helps it retain water and is an effective treatment for people who have overactive bladder function(Frequent urination). 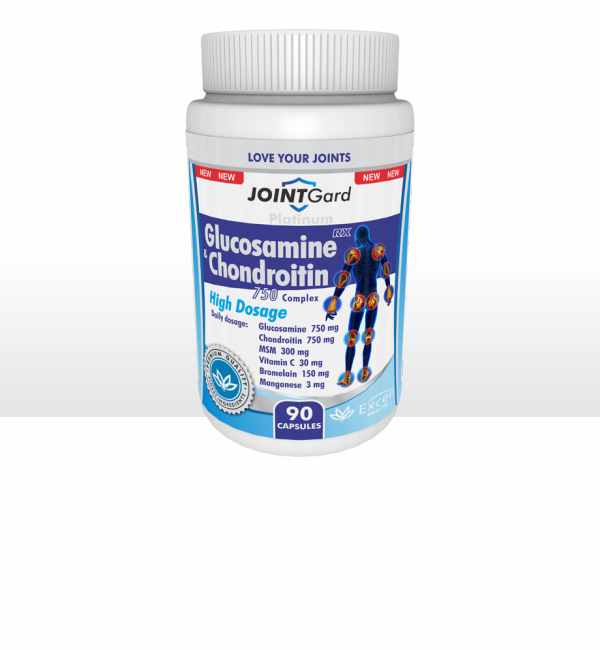 Glucosamine and Chondroitin in combination. Chondroitin works synergistically with glucosamine and the combination of Glucosamine and Chondroitin is very effective in patients with Osteoarthritis and Joint problems. The combination is popular for the treatment of pain and loss of function associated with Osteoarthritis(OA). MSM(Sulfer) is organically bonded sulphur, a substance that occurs naturally in the body. It is an effective treatment for chronic joint pain (Osteoarthritis, Joint inflammation and, Rheumatoid arthritis). MSM(Sulfer) is critical to the production of Collagen(the building block of joints, other connective tissues, nails, skin and hair). MSM(Sulfer) relief Joint pain in athletes and patients, it also improves injured athletes recovery by 58%. MSM(sulfer) is a wellknown antiaging supplement which main benefit is to keep cells, skin and blood vessels elastic, an attribute of youth. MSM(sulfer) prevents brittle hair and nails. MSM(Sulfer) lessens inflammation, pain, stiffness and swellings due to arthritis. It also relieves leg and back cramps and muscle spasms(night cramps), or cramps during athletic activities. Bromelain speeds up the body's healing process after surgery and is a natural pain killer.